How in the world am I going to ever deny my baby Bimmer anything in her life? I only went to two stores and came home with this much stuff for her. 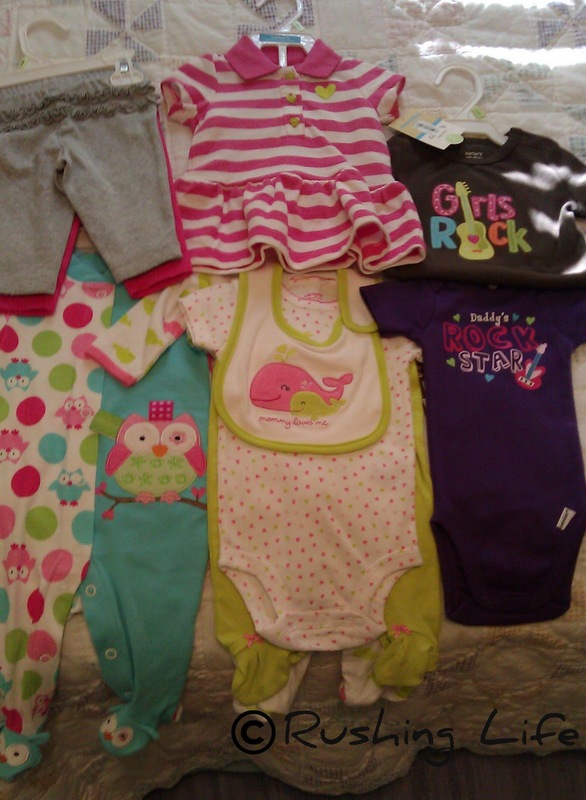 This much MORE stuff... since I am so certain Aunt Kimhead and Aunt Rachel are already stockpiling stuff for her. Oh yeah... and my parents too. I'm quite certain they ran straight to Babies R Us the moment they heard Bimmer was a girl! I even showed a ton of will power with these purchases. I skipped the zebra print pants and the baby jeggings. I skipped the plaid overalls. I skipped the cute little onesie with a giraffe on it. I skipped the three-pack of ruffled Gamecocks onesies! Now we just gotta shift our focus to the baby registry. We already have the stroller, car seat, carrier, monitor, and swing/seat. Any suggestions from the moms on what I need to make sure not to forget?!? !